llbit and I made a game. It started out as a weekend project, but we threw in a couple of more days of work to brush it up for the Game compo at Revision 2013, where it placed 2nd. 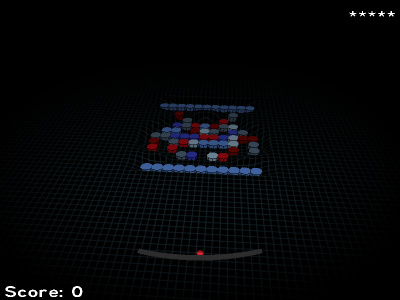 In brief, it's a first-person arkanoid in curved spacetime. Try it out! It's actually quite enjoyable. Notice, by the way, that the law of conservation of energy holds. Every time a block vanishes, the energy that used to be its mass is added to the speed of the ball. This is also illustrated by shifting the hue of the ball from red towards blue. Gravazoid has a pouët page and a GitHub repository, and there's a youtube video of me playing the game live during the compo. Great! Do you consider releasing the soundtrack? The soundtrack is released, in that it's part of the (released) source code (see sfx.c). Very nice and tiny game! Great! The only question - how to run it in window (linux version)? To run in window (not fullscreen) run with -window command line option. As one of the non-coder types I'd like a rendered MP3 of this great tune too. i just ported this nice game to OpenPandora Handheld. Thanks for the game and the sources.